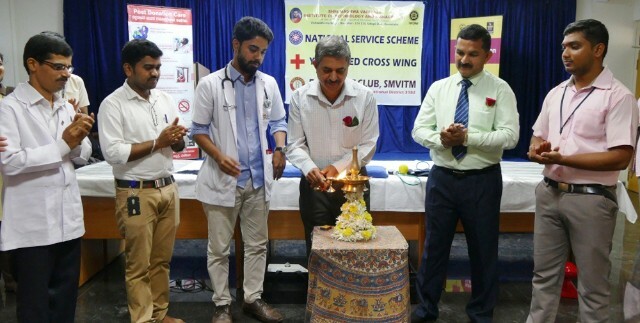 Udupi, 06 Apr 2018: National Service Scheme (NSS), Youth Red Cross wing, (YRC) and Rotaract Club of Shri Madhwa Vadiraja Institute of Technology and Management (SMVITM), Bantakal, near here, in association with blood bank of KMC, Manipal organized blood camp at the institute premises on Wednesday, April 4. Chandrashekhara Rao Kuthyar, lead consultant, SangamOne Private Ltd, Bengaluru and the adjunct faculty in the department of Computer Science inaugurated the camp. Dr Ashwin, doctor-in-charge, KMC blood bank, Dr Thirumaleshwara Bhat, principal of SMVITM; NSS/YRC/RC coordinator Kishore Kumar Aroor, heads of departments, departmental coordinators, office bearers, members of the NSS, YRC and Rotaract Club and student volunteers were present during the inaugural function. More than 200 volunteers, including faculty, staff and students of SMVITM and public have donated blood with a total of 200 units of blood collected at the camp.